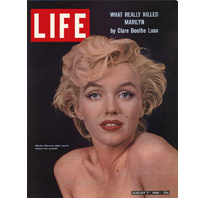 Original LIFE MAGAZINE Aug 7 1964 What Really Killed MARILYN MONROE With an article about the Marilyn "suicide" by Clare Boothe Luce, excellent condition, label present, only a slight wear, nice copy, no foxing present, no markings, and great old photos and ads! All pages are present and intact. Great ads, in a nice scarce copy! Excellent Condition! No tears, page seperations, staining or any flaws. Spine tight. Highly saught after issue.